As Nigerians continue to call for the return of Super Eagles forward, Victor Moses, to the senior national team, Head Coach, Gernot Rohr, insisted Wednesday that the former Chelsea forward must show commitment and be ready to fight for shirt. The Franco-German tactician had expressed shock when the ace winger informed him after the last World Cup final in Russia that he wanted to take a break from the team and resuscitate his dwindling career at Chelsea following the appointment of another coach in Sarri. As fate would have it, the club coach declared the Nigerian forward surplus to requirement and urged him to seek action elsewhere in the ongoing winter window transfer. However Rohr who was on hand to watch the Nigeria Professional Football League (NPFL) match between host MFM FC and visiting Enugu Rangers at Agege Stadium in Lagos said that the player can still be part of his team to the African Cup of Nations if he show commitment and be ready to fight for shirt. Moses was a major actor in Nigeria's best World Cup qualification story as Super Eagles secured a berth to the Russia 2018 with a game in hand. But at the finals, the pacy winger was a bit below par in the three matches that the team played before it was edged out by Argentina. "Victor Moses is a player with lots of qualities. His pacy moves on the flanks give the team a lot of options to attack opponents but the premature retirement changed a lot of things and during the last AFCON qualifying matches, we have adjusted with the players we have. "If he wants to come back, it's an advantage to the team only if he can attain the standard he puts up in the last installment with the team. "He must show a lots of motivation, he must show that he is fit to play for the team because we have other players playing well in his position now. "Moses has to be strong to come back to the team because we have more options on the wings now like Samuel Kalu, Samuel Chukwueze, Alex Iwobi and Ahmed Musa. All these players are very good on his wings, he remarked. Nigeria will play Seychelles in the last group match in Asaba, Delta State and few days later, it will confront Egypt in high profile international friendly match at same stadium. 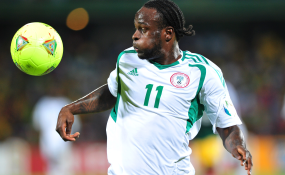 Rohr however did not commit himself to whether Moses will be part of any of the two matches in the buildup to the tournament in Egypt this summer. "We will invite the fittest players for the AFCON qualifiers against Seychelles and the friendly match against Egypt. The best of them will play the Match. "With the level at which some of the players are now in their different clubs, I believe they should turn that form to the national team. "Some of the players in the domestic league will be available for the two matches but it's unfortunate that the league did not start on time for us to know the fitness level of the players for a major tournament," he remarked.